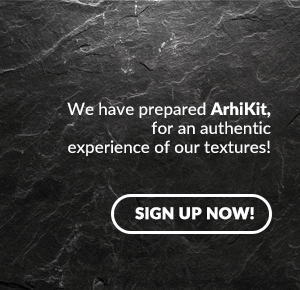 PIATRAONLINE presents another European premiere in interior and exterior decorations projects. 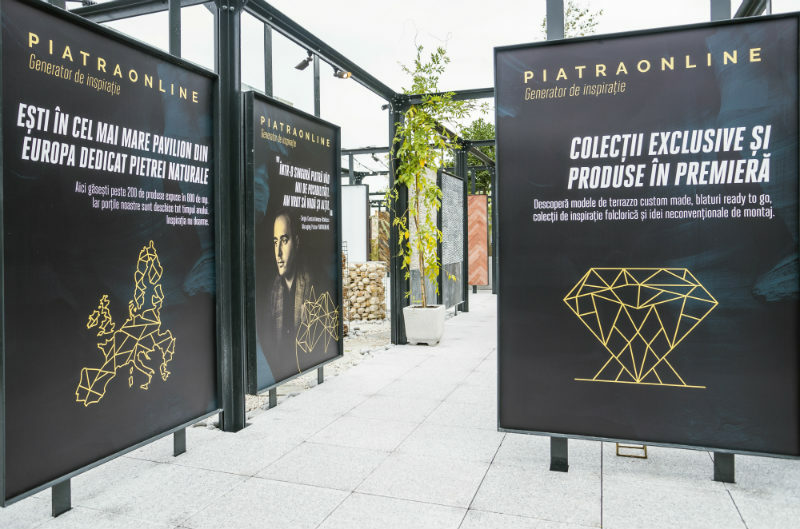 The natural stone pavilion opened on 21st of September is the largest in Europe and the first of its kind in Romania. 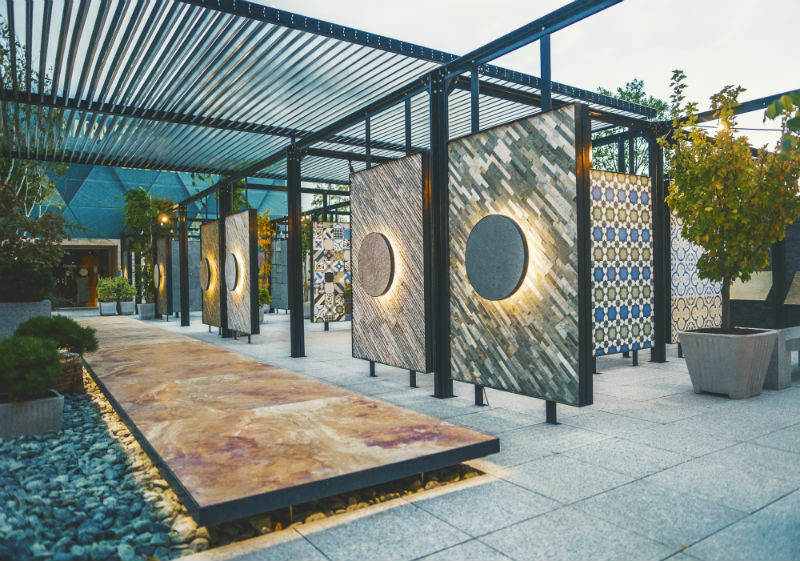 This unique showroom covers an area of 800 sqm, offering to visitors more than 300 products from a wide range: marble, granite, travertine, slate, limestone, quartzite, SKIN Flexible slate veneer, each and every one available in many size and finishes. In here, visitors walk among natural stone, while discovering many ideas. 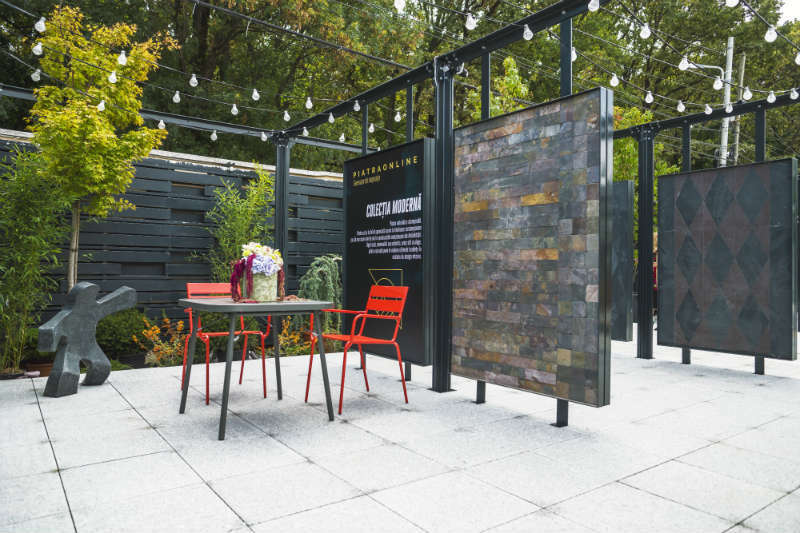 The pavilion looks like an art gallery, beautiful and efficient organized, landscaped with lots of green, furniture pieces and decorative elements (iron, glass or wood), very well balanced with natural stone, as you can see from the photos of this article. Plus, a catwalk, raised at 3 m, with a special design, offering a view from above over the entire Pavilion area. 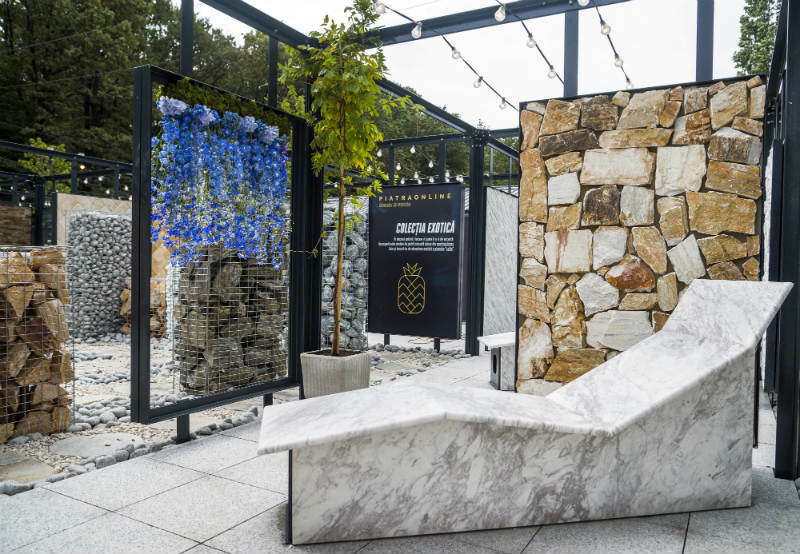 There are themed areas for helping visitors understand better the diversity and huge potential of natural stone. 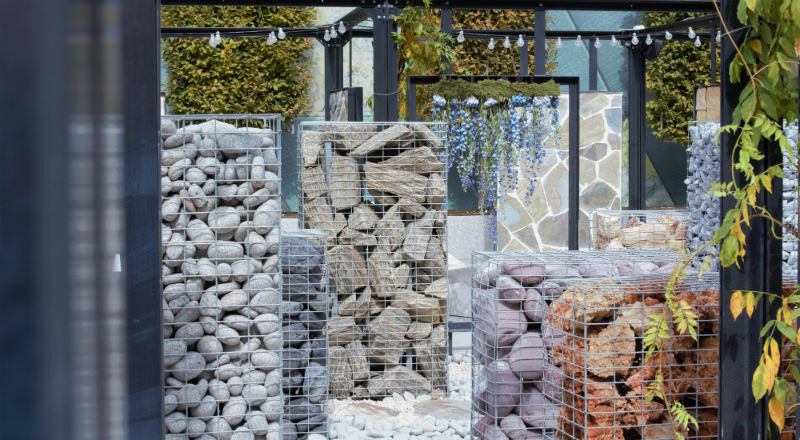 For example, the traditional-rustic area features an oven and barbecue, both fully functional; in the proximity of this area we have 2 marble lounges; the Mediterranean sector offers a large variety of stone for making gabions, already popular in Romania for outdoor decoration projects. On the other hand, for terrazzo we dedicated a large area, judging by the increased popularity for this material on the Romanian market. You are probably familiar with the fact that terrazzo tiles were used successfully for interior decoration projects and also exterior, for flooring or cladding, highlighted by kitchens, bathrooms, restaurants, hotels, bed and breakfast facilities etc. New collections, new models. Lower waiting times. Oriental terrazzo tiles pattern displayed in here have Colombian inspiration and were designed especially for the Romanian market, exclusivity of PIATRAONLINE. 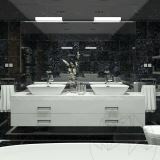 Another point of attraction is a collection of countertops for bathroom and kitchen. 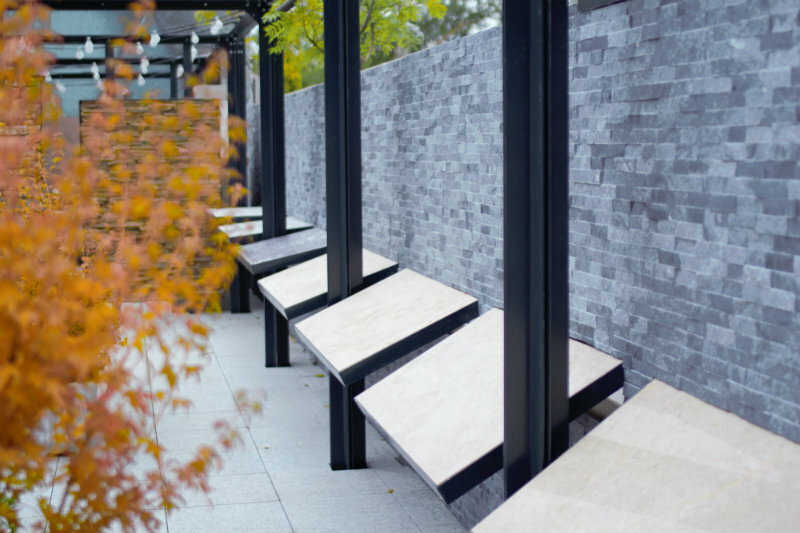 From marble, granite, travertine and limestone, these countertops can be discovered on the side of the pavilion, in a unique disposition, for better admiring the veins of each material. Countertops have size that fits perfect with many interiors of bathrooms and kitchens, so they can be bought directly from our warehouse, the same day you’re placing the order. PIATRAONLINE introduces a new formula for its sales team starting from this month. Besides sales assistants, we have a group of young architects in our Sales Department, for assisting visitors in showroom and the Pavilion, offering them all the needed information, apart from technical data and ambient design (compositions with chromatic and texture mixes). PIATRAONLINE stocks are expanding, starting with this month, because the storage area is now with 2600 sqm larger, up to a total of 7000 sqm. Total area of products (if unpacked) in our stock exceeds 250.000 sqm and will continue to grow each month. 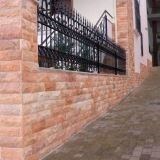 A large stock means more options for the fans of natural stone and also less time spent between placing the order and delivery time. 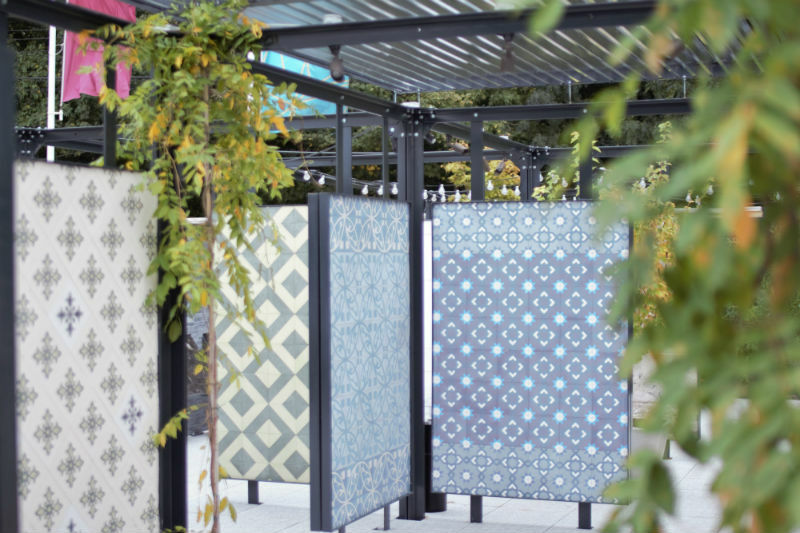 The new pavilion opened in Bucharest can be also a space for inspiration, in interior or exterior decoration projects, whether public or residential. 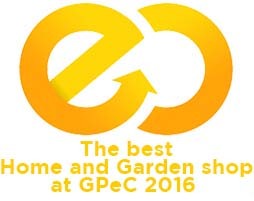 Keep in mind that although the pavilion is outdoor, all these products, with few exceptions, can be also used for interior decoration projects.